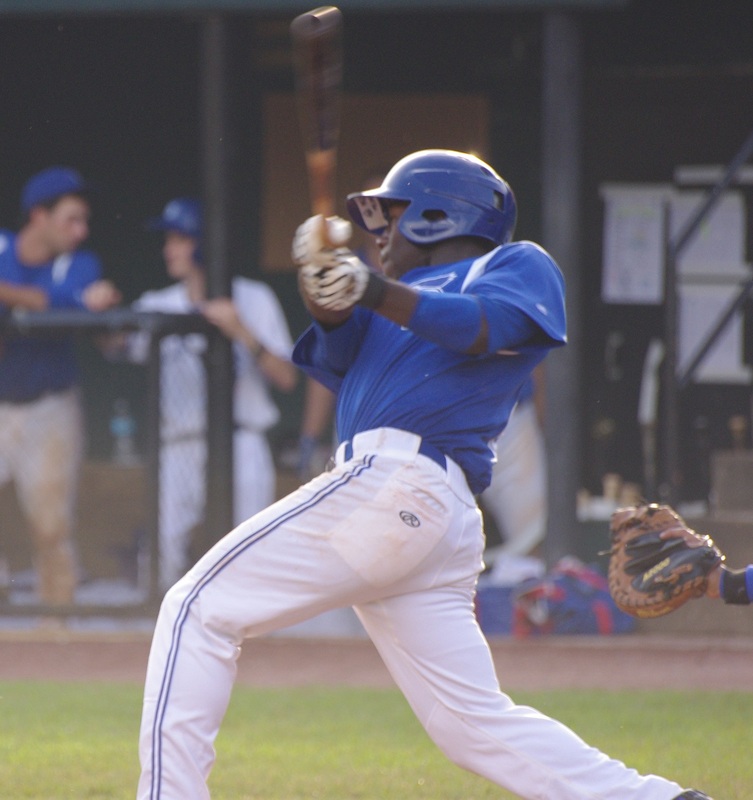 This is the second part of my ongoing series reporting on the players that I saw for the Bluefield Blue Jays, Toronto’s Rookie League (Advanced) affiliate in the Appalachian League. Click on the links for Part 1 or Part 2. This part looks at some of the lesser known position players on the Bluefield club (some were drafted this year) and I’ll highlight some guys that could become sleepers in the coming seasons. People in Bluefield remember Kevin Pillar, now in Triple-A Buffalo, who was playing in the Appy League in 2011, as an example of a player who came through who has really moved quickly through the system and made a name for himself. Is there another Kevin Pillar here? Please remember that I’m not a scout. I think that I’m not bad at picking things up in terms of a player’s mechanics, but I also keep my ears open (especially when I’m sitting near scouts or other players) and I’ll report on things that I’ve heard. I also find it very tough to watch all aspects of a player’s performance, especially when I’m also trying to get photos at the same time. Jonathan Davis – Jonathan Davis made a fairly strong impression on me and it wasn’t because of the home run he hit. What is impressive about JD is the fact that he shows extremely good command of the strike zone. As a college draftee in 2013 (15th round), Davis is coming into Bluefield as a 21 year old and is really showing his maturity. In 22 games so far, he’s walked 10 times and struck out 11. I saw Davis take several walks being very patient and waiting for his pitch. What was most striking was that he was taking pitches out of the strike zone that other players would be swinging at, particularly against the same pitchers. Davis does have some power (as evidenced by the home run he hit) but again, the most impressive aspect of his hitting right now is his ability to work the count. The home run he hit was completely unlike Dawel Lugo‘s. Lugo took a pitch that was probably out of the strike zone (I was watching from the side so I couldn’t see the strike zone well) significantly over the fence. Davis hit a pitch that was clearly a mistake, thrown right down the middle. It’s a good sign that he didn’t miss as good hitters make pitchers pay for their mistakes. When it comes to defense and speed, Davis looks to be above average at this point. He was picked off in one of the games, so he may need to adjust to pitchers’ better pickoff abilities in the pros. 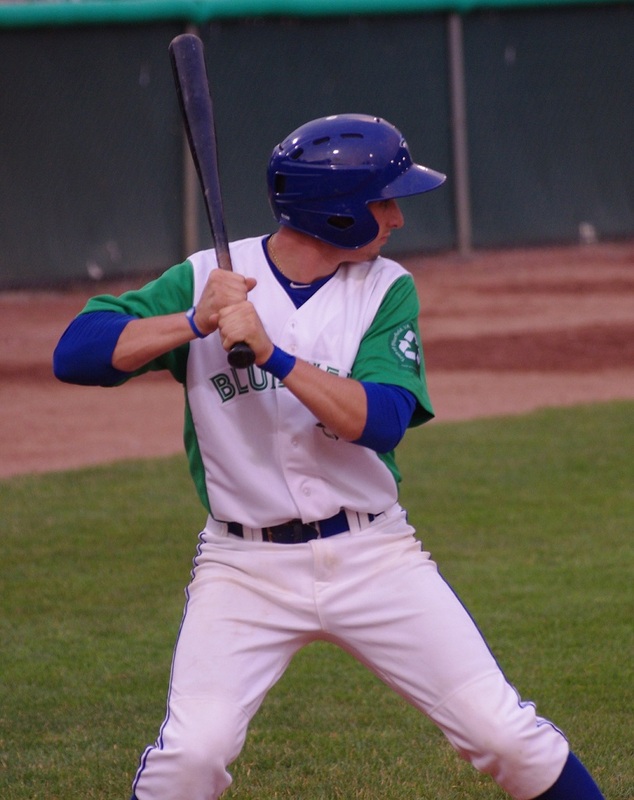 Derrick Loveless – Loveless is a 20-year-old outfielder who was the Jays’ 2011 27th round draft pick. He is now really starting to put up some solid stats after two rather poor seasons in the GCL. The pop in his bat as well as good speed have always been apparent (especially when looking at his triple totals) but he’s finally hitting for a solid average. To be honest, I didn’t really see Loveless do anything special and he went 0-fer while I was in Bluefield. He came out gangbusters at the beginning of the season but had gone into a slump while I was there. He seems to be coming out of it with hits in his last three games including a triple and two doubles. As is the danger with young players, inconsistency is going to be one of the key obstacles to overcome. Nico Taylor – Taylor was recently demoted from Vancouver and will most likely see some more playing time in Bluefield. This is not really a good thing for Taylor’s career, however, as he is already 23 and in his third year with the organization after being drafted out of Northwood University in the 38th round in 2011. Taylor wasn’t doing horribly in Vancouver and I won’t speculate as to why he was send back to Bluefield to repeat a level at which he didn’t do badly the previous season. Taylor is a big guy (6’4″) who can definitely hit the ball hard, although he doesn’t hit for a lot of power. He did hit a home run while I was there and also hit an opposite field base hit as well as a long fly ball to center field. Like most of the other guys in this report, I didn’t see anything unusual in the field leading me to believe that he’s most likely a solid fielder. Timothy Locastro – Locastro, a 13th round pick this year out of Ithaca College (New York State), was a shortstop in college who’s been getting a fairly regular look at second base with Dawel Lugo entrenched at short. He’s just turned 21 and was a junior at Ithaca before turning pro and he was known for his speed and contact ability in college. I have definitely seen examples of both. His swing is not very powerful but it very effective at making contact. He has hit four doubles and a triple, but has an ISO of .078 right now. He takes more walks than strikeouts and, like Lugo, seems to be able to make contact at will but he doesn’t nearly have Lugo’s power. He does have 7 stolen bases in 8 attempts and I can tell you that he’s pretty quick but also a smart base stealer. In the field, he’s also fairly solid but again, I didn’t take too many notes about his defense, meaning that it didn’t pique my interest one way or another. I see “Timmy Lo” as a solid, versatile organizational player who will probably end up as a backup infielder throughout his career as he moves up. If he can hit for a little more power and maintain a high batting average/OBP in the higher levels, he could be more. Jorge Saez – The final profile I’ll write today is for catcher Jorge Saez. Jorge, or “George” as he’s known to his teammates, is one of the most engaging, outgoing players on the Bluefield club. Very forthcoming and self-effacing, like many of the catchers I’ve talked to or emailed with in the Blue Jays organization, he understands his role as a late round pick (32nd in 2012 — the same round that Kevin Pillar was selected in 2011) amongst all of the bonus babies. I liked what I saw out of Saez, who is getting a chance to play every day and improve both at the plate and behind it. Saez is still 22, which makes him one of the older players on the team and his bilingual abilities (Spanish/English) as a native of Miami from a Cuban family makes him one of the team’s leaders. At the plate, I noticed that Saez has a smooth stroke and didn’t have any trouble getting around on low-90s fastballs that were thrown to him. He pulled a ball to left field for a single in the first at bat that I saw and had four hits in the four games he played in and was an instrumental contributor in Bluefield’s successful homestand. In 2 games since I left Bluefield he’s had three hits including his second home run of the season and there’s definitely some pop in his bat. Defensively, I’d say that he’s pretty good behind the plate. His movement is natural and he appears to be able to frame the ball well. I saw him throw out a runner at second base on a perfect throw on a changeup by the pitcher. I find it difficult to evaluate catchers, but he looked very comfortable behind the plate and seems to have at least an average arm (if not better). His overall numbers support this: he has thrown out over 40% of runners in both of his professional seasons so far. Saez told me that he’s definitely working on getting back to being more selective at the plate and cutting down on his strikeouts: he’s very aware that he walked a lot more and struck out less last season, although it may be tough for him to reverse the trend entirely against better quality (and more mature) pitching in the Appalachian League. It’s hard to speculate about what these Bluefield Blue Jays will become. It’s still early days for many of these players and the old “lightbulb” moment could be just around the corner. None of these guys are dominating and none of them are in over their heads (although Taylor has been ripping it up since he got here and has probably outgrown this level). A combination of working on some things in their mental approach and tightening up others in their mechanics combined with more consistency could lead to big strides . . . or they could fail to make adjustments necessary to compete at higher levels. This is the most fun about prospecting — seeing who develops and who doesn’t. If you ask me, Davis profiles most similarly to Kevin Pillar. Both are college players and and have solid tools (although neither stand out for their tools). Pillar really understands the art of hitting and, in a small sample size, Davis has also really shown one of the skills that many young players don’t – control of the strike zone. It’s way too early for me to see Davis as a major leaguer, but I feel like he can definitely move through the organization within the next couple of years.